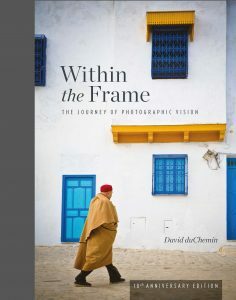 The very talented author and photographer, David duChemin, has just announced his 10th anniversary edition of Within The Frame! To celebrate this release, he answered a few questions for us to share with you. Enjoy! Congratulations on the 10th anniversary edition of Within The Frame! Within the Frame was your first book, published in 2009. What compelled or inspired you to write the book in the first place? Thank you! It’s been an incredible, and totally unexpected ride, and it’s such a thrill to see this book have such a long life in so many languages around the world. It seems incredible looking back at this but I had no inspiration at all to write a book until a now-defunct publisher asked me to write a book about travel photography for a series they were doing. It wasn’t far off the “tips and tricks” style books I dislike so much, so I declined thinking if I was going to write a book about what I do, that it would be on my own terms. And then I started asking myself what that would look like. What I realized very quickly was that I had no interest in writing a book telling people how to choose a tripod or repeating the usual platitudes. I wanted to go deeper and talk about vision and intent, and make it a really human book more than a technical book. Once I was so far down the rabbit hole thinking about it, I discovered I had an idea and something like an outline and I couldn’t let it go. It felt like there was a hole in the market, a book that hadn’t been written, and Within The Frame is the result of me actively wondering if I could fill that hole. Revisiting the book in preparation for this new edition brought you face to face with your own work and practices from a decade ago. What has changed in your photography practice since then? Did you learn anything from going over your own work, or were you reminded of any ideas you’ve abandoned in the last decade? I think my photography has changed considerably over those 10 years and become more mature (whatever that means). My ideas have simplified too, I think. I have always been the “gear is good, but vision is better” guy, but the gear means even less to me now than it did back then. I’m even more certain now that the best images take vision and intentionally exploring a place, and the really good ones rely much more on great storytelling and composition or design than just pretty light. So maybe it’s not so much that my work or my ideas have changed so much as they’ve become simpler, more focused. Who do you see as the ideal reader of Within the Frame? And what do you hope they take away from the book? I think anyone with even a passing interest in photographing places and people will find something for them in Within The Frame. Like I said, I wanted it to be a more human book than what was out there at the time, and what is still out there to some degree. We focus so much on the technical, and I think that while craft is important, it’s not the most important. I continue to get letters from people who are only now picking up Within The Frame and telling me how much it has changed their perspective on this craft and their own art. Because it’s not about technique I hope anyone from the beginner to the more experienced photographer might find something in it to light a new spark for them. As for what I hope they take away, I think it’s the freedom to explore and express their vision wherever it is that happens for them. For some it’s around the world and in new cultures, as it has been for me, but for others it’s around the corner. And I hope they take away the idea that their vision is the starting point for better photographs, and you can do that no matter what gear you use. In your eyes, how has photography (or the photography industry) changed in the last 10 years? Well the industry has, but the craft? Not really. I mean, yes, there are new technologies. Cameras are bigger, faster, better, right? But isn’t it time we focused more on the stories we tell than on how big our images are, or how sharp they are? The great gift, I think, of better, smarter cameras, is that we can more quickly get past the learning curve of technique and get on with being creative and finding new ways to say what we want to say. Cameras will continue to evolve and I have no idea what they’ll come up with in the next decade, but they won’t replace the need to be present and understand composition or visual language. They won’t replace the need for vision on our part. What else is on your plate for 2019? Astonishingly, not much. If I have my way at all I won’t get on another plane until November. I want, after so much travel for the last dozen years, to stay in one place. Maybe make some portraits. Write another book. Drink some wine. Do something with all these photographs I’ve spent the last decade making. Sometimes we get so caught up in making photographs that we forget to print them, or make them into something more tangible than just a post on Instagram. I want to explore that. And after all these years of being somewhat nomadic I’ve finally bought a home, a place to put down some creative roots. It’s in this crazy beautiful and quiet place on the coast of Vancouver Island and I can’t wait to explore that a little more, see what the world looks like through my lens without having to get on a plane to do so.